This product is a bright and shimmery embossing powders. 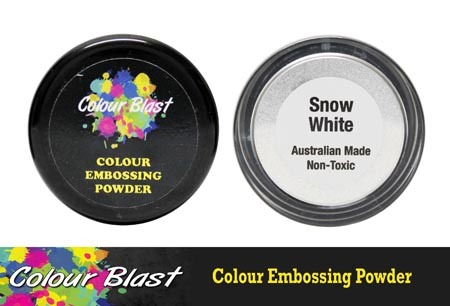 This embossing powder has been designed for mixed media, so it is NOT a clean embossing powder. When you use this embossing powder you will be left with a MICA residue. We DO NOT recommend this embossing powder for those TRADITIONAL paper crafters who like a clean finish. Directions: For use on paper, cardstock, chipboard, wood, metal and other surfaces. Apply a wet ink to the surface. Sprinkle embossing powder onto the wet inked area. Sprinkle excess embossing powder back into the jar. Use a heat tool to melt the powder. Repeat this process for a desired finish.